Europe In Autumn (review here) was a favourite of mine a couple of years ago. It managed that trick of providing a challenging read full of complex scenarios and political intelligence without ever stopping itself from feeling like a great spy thriller. Its sequel is equally challenging, taking the springboard of the first novel's brain-warping twist and running with it. 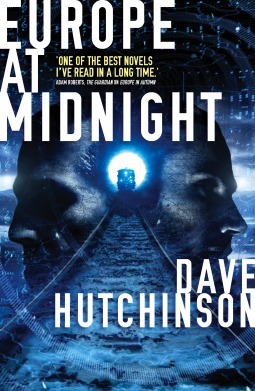 I say 'running', but Hutchinson again takes a calm, detailed pace, keen to keep us feet-on-ground with small moments like people actually needing a drink or some food, or noticing the weather, as well as plunging through byzantian conspiracies and violent confrontations. For those wishing to take on this series without spoilers, please stop here and go off to read Autumn. Have they gone? Sure? I can hear one of them still putting on their coat? Right, the rest of you I can only assume have read Autumn, don't care about spoilers, or are the kind of person who walks through doors marked 'danger, keep out' with a wry grin. That last set of people will identify with Rudi a little, the last book's hero (who, spoilers, makes a slight return here), but less so with Rupert and Jim , our two main protagonists here. Jim is an intelligence officer in London of the future, the future we know from Autumn - a Europe dissolved and decimated by a virus. Rupert is, meanwhile, a resident and key official of the mysterious, dystopian world of the Campus, and Hutchinson boldly starts his tale here, slowly revealing the dark history of the place, before moving focus to meet Jim and follow a case that leads us first to the big reveal of Ernshire in book one, and then connects through to the Campus world. More details than this would ruin a compelling, profound and moving story but suffice to say I recommend this novel whole-heartedly, with one piece of advice - stick with it. Like many a great political thriller (like with Le Carre, whom it references again) and many a complex sic-fi world-build, you need to allow the soil to form before you can run free across its land, and Hutchinson isn't immune to the needs of info-dumping at times (but who is), yet some elements are deliberately mysterious without character-motivation, particularly in the early chapters on Campus. So some patience is required as he holds back information seemingly purely for the sake of it at times. This is me stretching for issues however in a novel that challenges, entertains and moves me in such a way that anything else I read this year is going to have to be something special to match up to. The horrific climax to this book brings home how close we are to such horrors today - Hutchinson fractured Europe grows more likely every day - and all the mystical portals up canals don't dilute the harsh reality he bases his excellent fiction on.